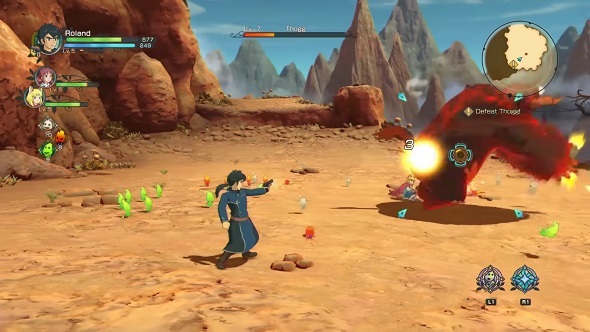 Ni no Kuni II: Revenant Kingdom offers a three-way toss-up for the title of ‘favourite Higgledy’ – the tiny spirits that support you in battle. It is between Runcible the Righteous, Filgree the Flighty, and Wiff-Waff the Wafty. But the decision will have to wait. We are about to solve some issues with a state-run casino town overseen by a holy pug before settling our own kingdom in order to unite the world’s nations (and give a bunch of sky pirates some work). JRPGs, eh? What are they like. Sad about the absence of Studio Ghibli in the sequel? The best anime games on PC should cheer you up. Revenant Kingdom is Level 5 and Bandai Namco’s follow-up to the half-made-by-Studio Ghibli 2011 original, this time lacking input from the legendary animation house (but with some former Ghibli staff on the dev team). Instead, we are looking at a purer Level 5 JRPG the likes of which you will be familiar with if you have played any of the studio’s previous output – which, to be fair, you probably are not if you play all your games on PC. The game offers a dual narrative split by its two protagonists. On one side is the child king Evan, deposed from his rightful throne and aiming to give all the people of the world a ‘happily ever after’ (not a terrible euphemism). On the other side is the staid, robust Roland, a visitor from another world who has his own more adult concerns and motivations. Also he has a gun, naturally. This approach allows Level 5 to present a narrative that ticks the usual child-friendly qualities you see in the genre, while at the same time mixing in a bit of the harder stuff to keep older players interested. Admittedly, a few hours with the game do not show much of this second element, with Revenant Kingdom’s opening comprising a fairytale fantasy of warring cat and mouse tribes, gorgeous bright colours, and non-threatening conflicts. Which brings us back to the issue with the casino town of Goldpaw. Modelled on Taiwan, this neon-drenched den of debt and gambling’s misaligned sense of hope does not just offer the chance to put your money on the line in games of chance. No, this is a town where taxes, judicial trials, even the chance to enter the town-pug-boss’s office comes down to the roll of the die. There is an obvious spoiler coming here, so avert your eyes for this line if you want to remain pure: all the dice used by officials are loaded. Shock! This revelation leads you on a quest to discover the truth of what is going on behind the scenes and why Goldpaw’s people are all in as much debt as they are. You can see those who have debt thanks to a magical irritant in the shape of a crow demanding immediate payment following close beside anyone who owes the state money. An imaginative (and rather pretty) setup leads to a relatively straightforward quest: simple infiltration, pressing your interact button repeatedly until mission-critical items are found, attempting to leave the area before being set upon by a mid-boss, returning to the town and fighting the area’s Big Bad. Standard, yes – but also enjoyable. Level 5 know how to make good JRPGs, after all. 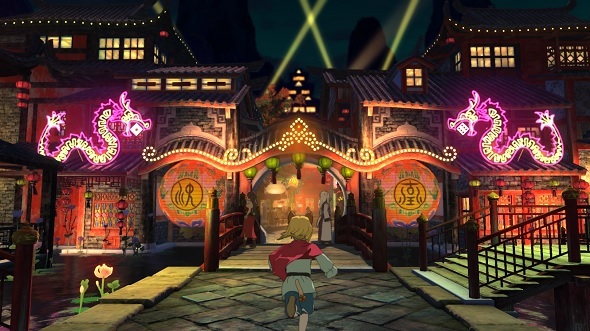 Moving on from the Goldpaw chapter, you unlock a new element to the Ni no Kuni series – but not something new to Level 5 – in the form of city-building. While hopes for a Settlers level of interaction are soon dashed, this simple and straightforward minigame offers respite from the traditional action elsewhere, as well as the chance to unlock bonus items, more support, and other such helpful additions. We are just hopeful microtransactions stay clear of your kingdom quest, but it does feel ripefor them to be featured here. We shall see. We shall also have to see how impactful the addition of Higgledies is, which replace the original game’s Familiars. 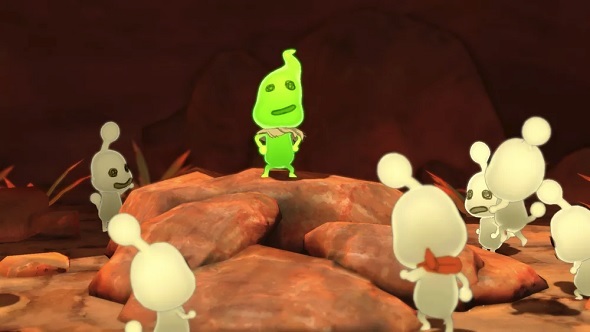 These Pikmin-like helpers can be acquired as you progress and join in on fights. Basically, when a few of the same colour of Higgledies group together, a circle appears – step inside, press the interact button, and you get a power dependant on the aforementioned colour. White, for example, brings a massive cannon onto the field that starts blasting away. Others offer healing, elemental resistance and the like – pretty straightforward, and nowhere near as time-intensive as looking after your Familiars last time around. Combat has been changed since last time, too. Instead of a turn-based approach it has moved into the realms of Tales-style real-time battles. Direct control with on-the-fly spellwork and melee combat is fun, but, frankly, we have no idea how much of the strategic demands will be retained as the preview version we played offered a hugely overpowered party that made every battle a walkover. Another minigame set to rip more time than you would expect from you is battle mode – because what kingdom is built on peaceful negotiation alone? Think Clash of Clans meets a very simple RTS (so just Clash of Clans then?) and you are on the right track. Again, this mode is not the main attraction and will not be something you are going to see much praise of, but it is a neat distraction and works well as a welcome break from the tweeness and melodrama. Speaking of melodrama, the original Ni no Kuni set the bar high when it came to how this was delivered. It graced our ears via some brilliant and memorable voicework, managed by a stellar translation from the Japanese original. Happily, Revenant Kingdom carries the same quality, with regional accents and colloquialisms galore, and some fine – though admittedly sparingly-used – voicework. A few hours with the game shows there is a serious limit on the number of voiced scenes. And with each of the main voice actors having total recording times of four or five hours apiece, it does not seem like this will change as the game goes on. There are questions to be answered about how much play time can be unearthed from the kingdom building and battle minigames – could they possibly be anything more than a brief palette cleanser? On the flip side, we hope we are not forced to spend too much time with these distractions either. After all, there is nothing worse than a game lasting three dozen hours that demands you play some irrelevant sideshow for quarter of that time. Even so, the early signs are promising. 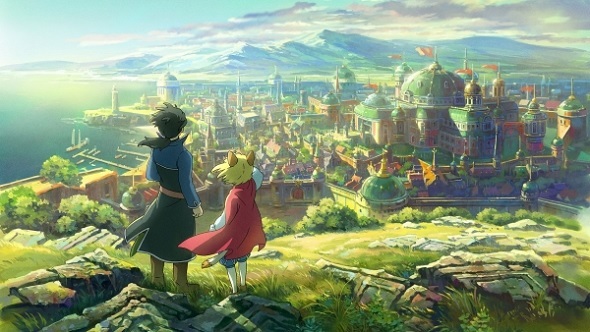 Ni no Kuni II: Revenant Kingdom no longer has Studio Ghibli attached to it, but all that really means is the cutscenes do not look quite as nice. They still do the job, and the actual gameparts have been made by a studio with a fine pedigree. In any case, we do not have to wait long to see now. 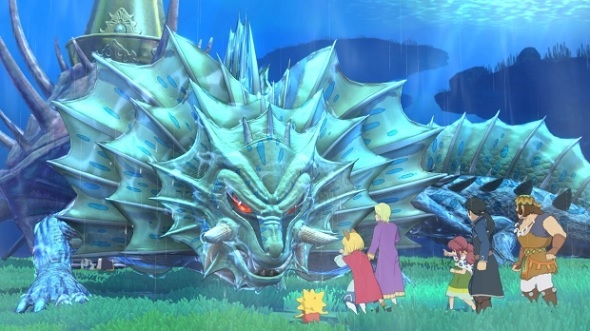 Ni no Kuni II: Revenant Kingdom releases for PC on March 23, 2018.